Well, the time had come...potty training. Granted, my boys weren't quite yet two, but they were showing some of those "signs" everyone talks about and with baby number 3 on the way, I figured why not just give it a try...it was supposed to be fun right?! The main reason I thought it might be "the right time" is because they are obsessed with the potty. They love to sit on it, they love to watch anyone go potty, they love to flush it, point to it, put things in it, I mean, they love it. They also like to say, "Poooopp" and point to their tushies and watch me dump the poop from their cloth diapers into the potty while saying, "bye bye". They often would pull on their wet diapers and make that sweet uncomfortable, "get this damn thing off me" face; all which were supposed to be good indicators that it might be "time". The only thing I was concerned with was that their language wasn't quite there. They surely communicate, but they defs weren't running up to me and saying, "Mommy, I need to use the potty". We were still dealing with single words here. Even potty was just a simple, "Pa" at this point. This method is an "all-in" approach which basically puts you and your child(ren) on house arrest. For three (long) days you do NOTHING but drink fluids, go on the potty and hang out talking about going on the potty. It is a commitment to say the least. While the suggested approach is to go for both day and night training, I felt that was a bit much for my little guys. They sleep a solid 10-12 hours a night and I was not willing to wake them up to go potty nor did I think there was chance in hell they would hold it all night as they wake up with a drenched diaper every morning. So, we modified and tried to attack day only training. The idea is to keep them naked from the waist down for the first day so they can see the potty and make the connection that it is coming out of their body and should go into the potty rather than on the floor. No pull-ups as that can make the chid think it is ok to go. Diapers and anything like diapers are forbidden! Needless to say, my little bandits were obsessed with the naked aspect and it was a dream come true for them to have unlimited access to their "potty parts". I too put on my "big girl pants", tried to control my anxiety at the loss of control I was about to have and started preparations for Potty Training Twins - Trial Run. First up, turing my guest bathroom into Potty Central. Toilet paper went away (they LOVE to unroll it and use it as if they were ribbon dancers), towels away, shower curtain up and all non-potty training equipment out from under the sink. We purchased an adapted seat for the "big potty" as I my hope was to not clean peeps and poops, out of anything, any longer. I also grabbed a little step from Ikea, so they could get up there. They still needed some help turning around, but they enjoyed climbing up to sit down. I loaded the bathroom with potty books and made charts using folders with stickers each of my little dudes could add to their sheet. My Thriving Husband and I perfected our potty dance, potty song and I prepared a jar of regular M&M's for the highly anticipated sugary treat to accompany each successful potty trip. 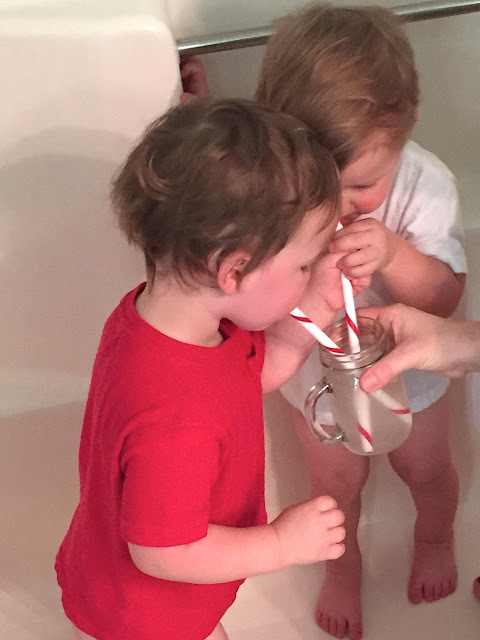 I prepared a cup with "Magic Potty Juice" (really watered down lemonade) and two big boy straws so they could share in the fun of pounding it. With the bathroom set up and ready to go, we bought some "big boy chonies", aka mini boxer briefs, and awaited that fateful Monday when we would run around naked and go in that potty! Within a few hours of Day 1, I cried a lot and was ready to run for the hills. I hated being cooped up in that damn stuffy bathroom, became frustrated when all they wanted to do was play in the shower, was easily overwhelmed as they ran around peeing on the floor, playing in it, scooping water out of the toilet and throwing it at each other...it was a lot. Especially since I am a ticking time bomb of emotions, thank you very much Baby #3! 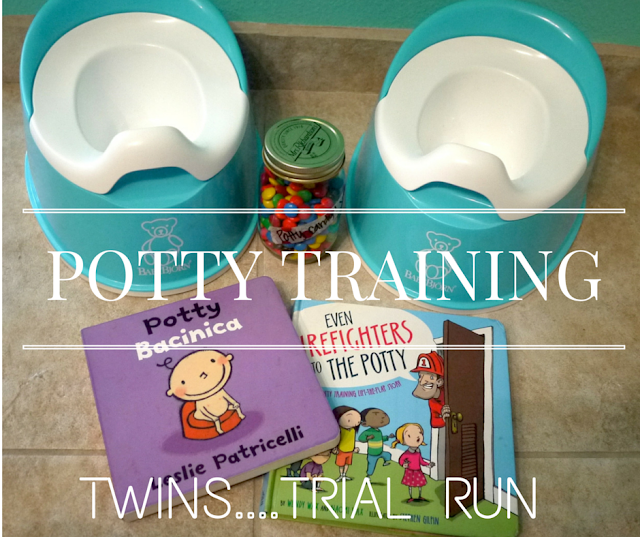 Even though my husband and I were working as a team, potty training two at once was NO easy task. My amazing Thriving Husband supported me, gave me time to regroup and we kept at it. The majority of the day was spent playing with toys in the hall near the bathroom or in the bathroom itself. We did decide to venture outside to play a little bit and sure enough, even though they both sat and sat and sat before we got some fresh air, they still ended up with wet shorts and peeps soaked tennis shoes. SHOOT! Drinking that magic juice in their favorite place...the shower! Back inside, back to the potty and more sitting. When they were on the potty they seemed to get it. When they were playing/eating/doing anything else, they easily peed their pants without flinching....hmmmmmm, what to do. It was clear the boys loved to take turns sitting on the potty, but we soon started running into problems. 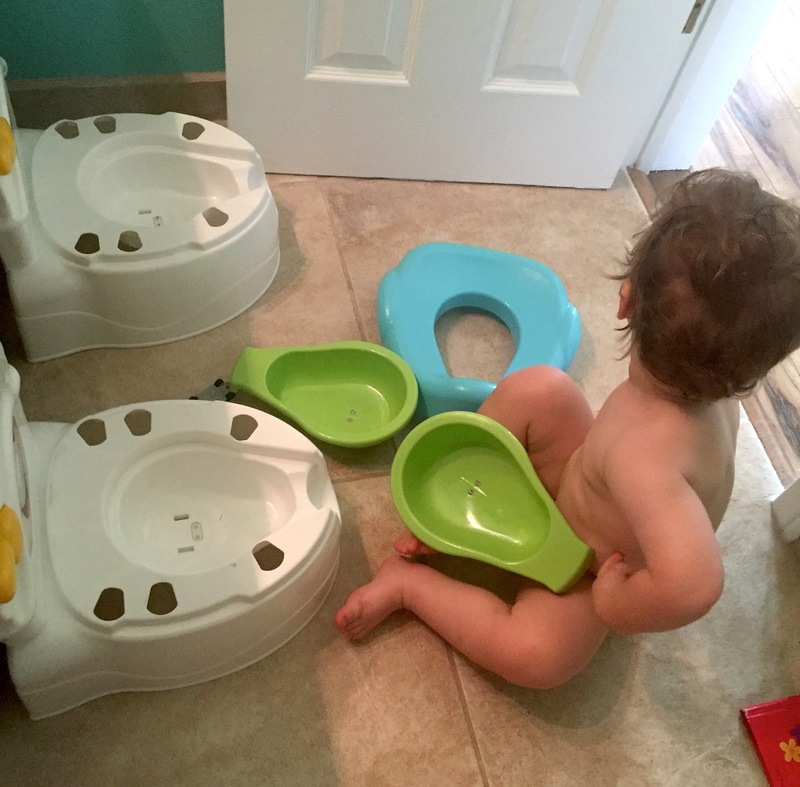 While one was taking his time sitting and playing with his (ahem) "potty parts", the other would be waiting and would have an accident. Our little Peanut seemed to catch on pretty quick. He would get SO excited when he watched his peeps come out and would squeal with joy when we broke into song/dance and gave him a potty candy. But my heart broke leaving Puss-Man out of the fun just because he didn't go at the same time. Of course I would sneak him a potty candy and tell him he did a good job trying/supporting his brother. I mean, what was I to do? Break his little heart over a single M&M?! I couldn't bear it. Don't worry, I did the same thing for Peanut if Clarke ended up going too....After a few more accidents and potty fights, we made a team decision to go with individual chairs. On Day 2 we switched it up....enter, the most over-stimulating potty chair that ever was or will be. When the boys woke up and sprinted to the bathroom to sit on the potty they stopped dead in their tracks when they saw their very own Tesla of potty chairs. The things flushed, they lit up, they talked, they had a number of different parts and while they boys were obsessed...they were a little too obsessed. They flushed and flushed and flushed and flushed to watch it light up and talk. They took it apart, they put it together. I mean it was really my version of Hell. They spent SO much time playing with them they idea of actually using them to go potty was completely lost. We only had one successful potty all day and this mommy was going to LOSE HER MIND. Those chairs had to go. I needed basic, simple, no excitement/stimulation potty chairs. Here is Clarkey-Puss taking it apart while Peanut runs around with another part of this potty...GEEEEZ! While waging war with those damn fancy chairs, I started to notice a shift by the afternoon of Day 2. Clarkey-Puss was starting to get very upset when he had to go in the bathroom. He didn't want to put on his big boy chonies and when he finally got them on, he would flip when we tried to pull them down to sit on the potty. Peanut was starting to get a little annoyed too. My mommy instincts started telling me maybe we needed to slow down a bit. The last thing I wanted was for them to be upset and start to hate the potty. I was not going to engage in a power struggle over using the big boy potty. 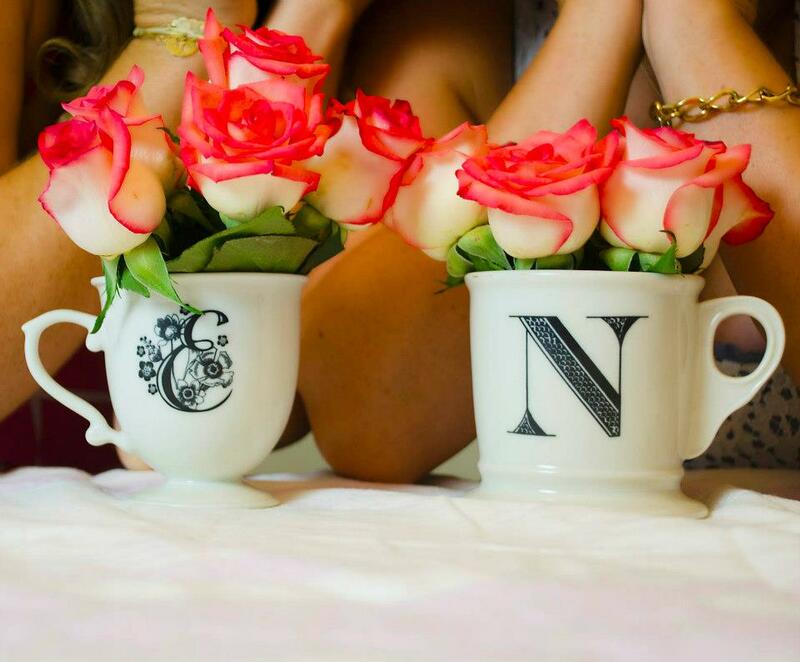 I wanted to support their feelings of independence and excitement for transitioning to a new stage in life. So, that was that. While I was secretly thrilled this nightmare was over, I was also heartbroken that my angels were not enjoying the experience. I took back control (hallelujah! ), and called The Trial over. We had made it two full days, saw great success and had learned a ton. Now I would shift my efforts/focus to a more "toddler led" approach for the time being. We could go "all in" again in a few months. I returned those fancy-shmancy, can't concentrate potty chairs, for the most simple and plain potty chairs. I used the potty step as a mini bookshelf for their reading material, kept the potty candy and stickers on hand for when they were ready. Since those two challenging days the boys have gone back to their love of the potty. Yes, they still wear diapers and go in them most of the time, but they also are signing when they want to go potty and are continuing to have success when sitting. They love to read on their chairs and are back to being thrilled to use them. While at first I felt that I was a total failure, I don't feel that way any longer. Now I am so happy we took the time to really try because we learned so much about better ways to approach the experience, especially with twins. For now, we will continue to go when they want to go, talking about it all the time, reading, singing and making it fun! Of course the most important thing I learned was NEVER to potty train your kids when you are pregnant. 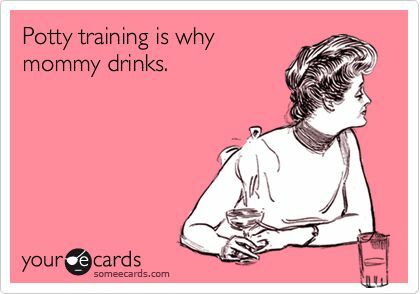 Wine is also something you will need...lots. 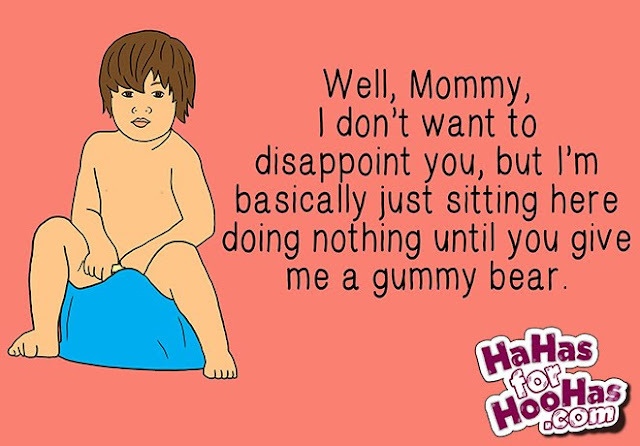 What potty training tips do you have for this Thriving Mommy? Anything really work for you?